Researchers from the Universitat Politècnica de Catalunya (UPC) and the Instituto de Astrofísica de Canarias (IAC) report the discovery of one of the most massive known neutron stars using the William Herschel (WHT), the Gran Telescopio Canarias (GTC) and the IAC80 telescopes. Neutron stars, also known as pulsars, are stars at the end of their evolution. They evolve from stars with masses ranging from 10 to 30 solar masses, and end as compact objects having a few solar masses, confined to a sphere just 20 kilometres diameter. PSR J2215+5135, discovered in 2011, is a neutron star in a binary system, in which the two stars orbit around a common centre of mass. The companion star, or secondary, is of solar type and it is strongly irradiated by the neutron star. Manuel Linares, a Marie-Curie researcher at the UPC, in collaboration with Tariq Shahbaz and Jorge Casares from the IAC, obtained photometric and spectroscopic data of PSR J2215+5135 using ACAM (in service time) and ISIS on the WHT, respectively. They also used GTC and IAC80 telescopes, and combined all the data, in a novel way, with dynamical models of irradiated binary stars, to directly obtain the mass of PSR J2215+5135. The WHT observations were key to measuring the optical light curve of the binary, modulated by the orbital motion of the irradiated companion star. Artist's impression of the massive neutron star PSR J2215+5135, which heats up the inner face of its companion star. Credit: G. Pérez-Díaz/IAC. Large format: [ JPG ]. The team measured the mass of PSR J2215+5135 to be 2.3 solar masses, making it one of the most massive neutron stars ever observed, out of more than 2,000 neutron stars currently known. The more massive the neutron star is, the faster its companion star orbits. The new method applied by Linares and collaborators consists of measuring the orbital speed of the companion star from the radial velocity of hydrogen and magnesium spectral lines. This allowed the team of astronomers to measure for the first time the speed of both the irradiated and shaded sides of the companion star, and to show that a neutron star can have a mass more than two solar masses. Within the past 10 years, the Fermi-LAT NASA gamma-ray telescope has revealed dozens of pulsars similar to PSR J2215+5135. In principle, the method can also be used to measure the mass of black holes and white dwarfs (remnants of stars that die with more than 30 or less than 10 solar masses, respectively) when they are found in similar binary systems in which irradiation is important. The determination of the maximum mass of a neutron star has important consequences for many fields of astrophysics, as well as for nuclear physics. How nucleons (the neutrons and protons that make up the nucleus of an atom) interact with each other at high densities is one of the great mysteries of physics today. Neutron stars are a natural laboratory for studying the densest and most exotic states of matter. These results also suggest that, in order to support the weight of 2.3 solar masses, the repulsion between particles in the nucleus of the neutron star must be sufficiently strong. This would indicate that it's unlikely free quarks or other exotic forms of matter could be found in the centre of this neutron star. M. Linares et al., 2018, "Peering into the dark side: magnesium lines establish a massive neutron star in PSR J2215+5135", ApJ, 859, 54 [ ADS ]. 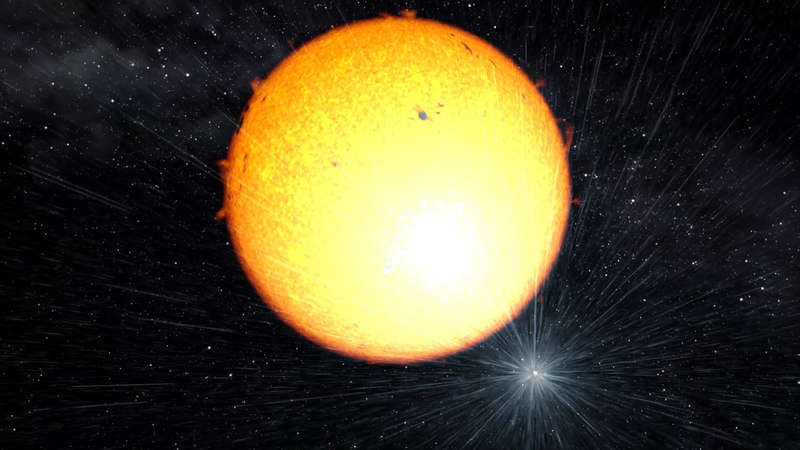 Video "A massive pulsar irradiates a solar-type star". 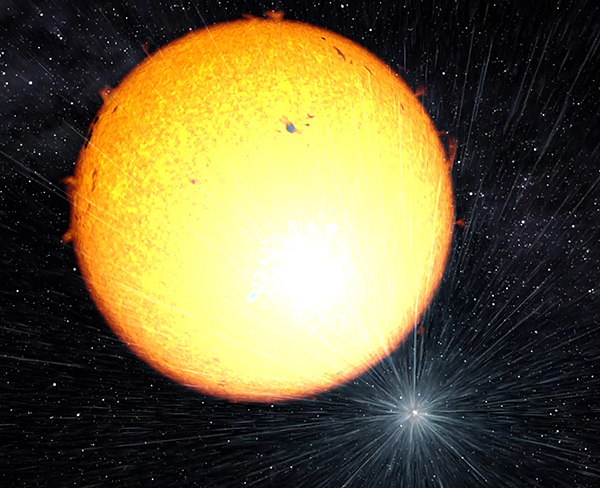 Video "A 2.3 Solar-mass neutron star in PSR J2215+5135". "Researchers from the UPC and the IAC discover one of the most massive neutron stars", IAC press release, 24 May 2018. "A Massive Neutron Star with a Two-Faced Companion", AAS Nova, 25 May 2018.